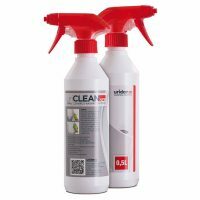 The simple daily cleaning is done with Uriclean®. The surface is sprayed with Uriclean which prevents the urine drops to adhering to the surface. UriClean is designed to go through the Urilock trap with out causing a problem to the oil. 5000ml of Uriclean will clean one Admiral urinal for 4-5 years. 5000ml of Uriclean will clean one Admiral urinal for 4-5 years.